Undefeated three-division world champion Mikey Garcia will attempt to win a world title in a fourth weight class when he challenges unbeaten IBF 140-pound world champion Sergey Lipinets on Saturday, February 10 live on SHOWTIME. The matchup of top-5 ranked junior welterweights will take place at the Alamodome in San Antonio, Texas and is presented by Premier Boxing Champions. Two-division world champion Rances Barthelemy will face Kiryl Relikh in a rematch of their May showdown on SHOWTIME, this time for the vacant WBA 140-pound world title. The doubleheader of title bouts in the wide-open 140-pound division sets the stage for a potential unification match. Tickets for the event, which is promoted by Ringstar Sports and TGB Promotions, are priced at $250, $75, $50 and $20. Tickets will go on sale next week and will be available at Ticketmaster.com. The 29-year-old Garcia (37-0, 30 KOs), emphatically returned to pound-for-pound lists in 2017 by scoring a highlight reel knockout of Dejan Zlaticanin to win the WBC Lightweight World Championship in January and then dominating four-division champion Adrien Broner on his way to a unanimous decision in July. Garcia is a member of a renowned boxing family, and is noted for his sportsmanship and his commanding presence in the ring, honed by his brother and acclaimed trainer Robert Garcia. 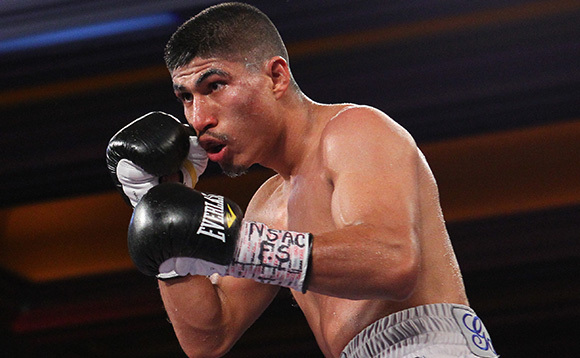 Garcia, of Moreno Valley by way of Oxnard, Calif., returned to the ring after a two-and-half-year layoff in July 2016 without missing a beat by stopping former champion Elio Rojas. Garcia, who has held world titles at 126, 130 and 135 pounds, has stopped 19 of his last 22 opponents including Roman “Rocky” Martinez, Juan Manuel Lopez and Orlando Salido. The unbeaten Lipinets (13-0, 10 KOs) captured a super lightweight world title in just his 13th pro fight by defeating Akihiro Kondo via a unanimous decision on November 4 on SHOWTIME. He is originally from Kazakhstan but moved to Russia when he was six years old. He currently lives in Beverly Hills, California, Lipinets and is trained by Buddy McGirt. The 28-year-old moved up the 140-pound rankings with victories over then unbeaten Haskell Rhodes, Levan Ghvamichava and Walter Castillo before knocking out Leonardo Zappavigna in a world title eliminator last December. Lipinets will look to stamp his place as an elite fighter when he takes on the accomplished and dangerous Garcia on February 10. Barthelemy (26-0, 13 KOs), who was born in Arroyo Naranjo, Cuba and now lives in Las Vegas, has won world titles at 130 and 135 pounds. He defeated Relikh by unanimous decision in his debut at 140 pound in his last fight on May 20. If he defeats Relikh again, he will become the first Cuban boxer to win world championships in three different weight classes. He defeated Argenis Mendez by unanimous decision to win the 130-pound world title in 2014 and a year later scored a unanimous decision over Denis Shafikov for the 135-pound world title. Barthelemy, 31, has two brothers, Yan and Leduan, who are professional boxers who he trains alongside with under the tutelage of Ismael Salas. Relikh (21-2, 19 KOs) believes that he won the first match with Barthelemy and that the scorecards did not reflect the competitive nature of the fight. The 28-year-old nearly had Barthelemy out after landing a barrage of punches that penned Barthelemy on the ropes, but he was only awarded a knockdown. In the eighth round, Barthelemy came back to drop Relikh with a body shot. Shortly after the May 20 title eliminator, the WBA ordered a rematch, this time to be contested for the vacant 140-pound title. This will be Relikh’s second world title shot after the fighter from Minsk, Belarus lost a unanimous decision to Ricky Burns in Glasgow, Scotland on Oct. 7, 2016.